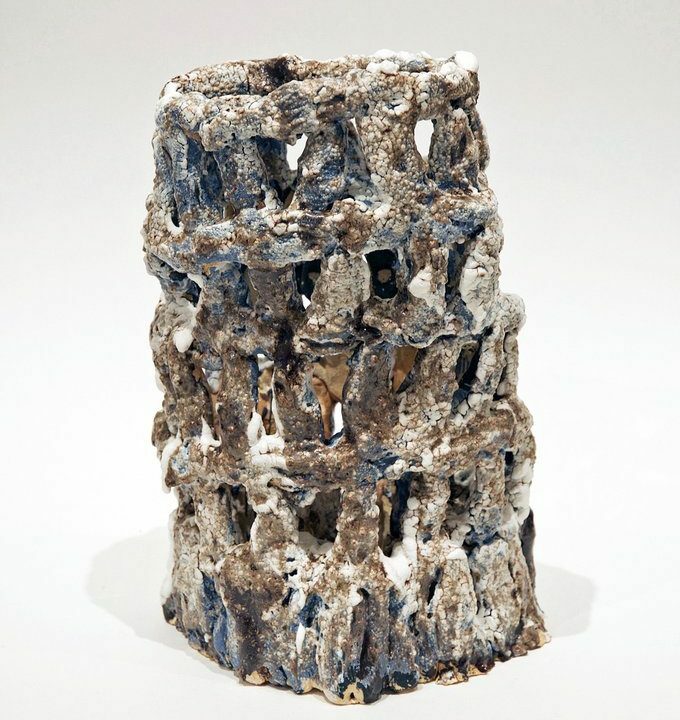 The ceramics and drawings of Sylvia Fragoso exude a vitality, sincerity and reverence that reflect the deep care that went into their creation, and the many years that the artist has single-mindedly dedicated to her craft. Sylvia started making art in her early twenties after joining NIAD. Over the last thirty years she has produced hundreds of clay sculptures: spiritually-inspired monuments that possess a humble beauty and strange power; mysterious clusters with crucifixes atop them that testify to her devout Catholicism, and crumbling towers, some with spiky projections jutting out from their thickly glazed exteriors. Likewise, her drawings are striking in their originality and conviction, evincing a brilliantly intuitive grasp of color and design. These mesmerizing abstractions and swirling striations – sometimes embedded with religious symbols – pulsate with color and energy, like mosaics that have burst open into hallucinatory vortices. Sylvia has exhibited globally at numerous galleries and art fairs, and her work resides in many private collections.